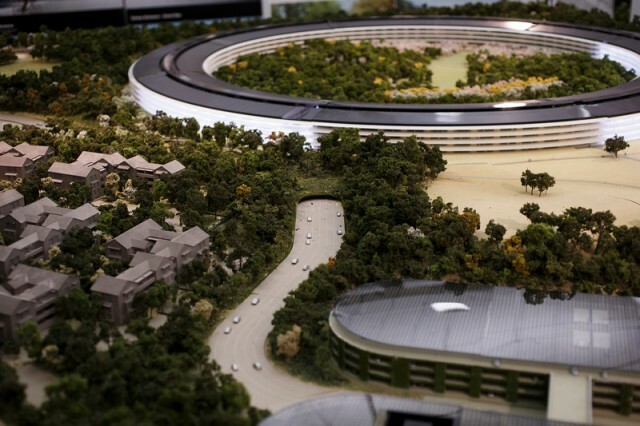 By 2016, the brand Apple will offer a huge campus in Cupertino, California. 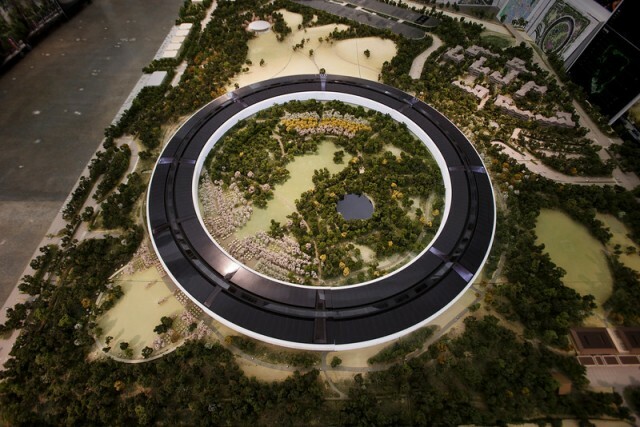 Project already defended by Steve Jobs in 2011, this set will accommodate 12,000 employees will be energy self-sufficient and will have the added bonus of an amphitheater. A model of the finished project is to discover in the future. 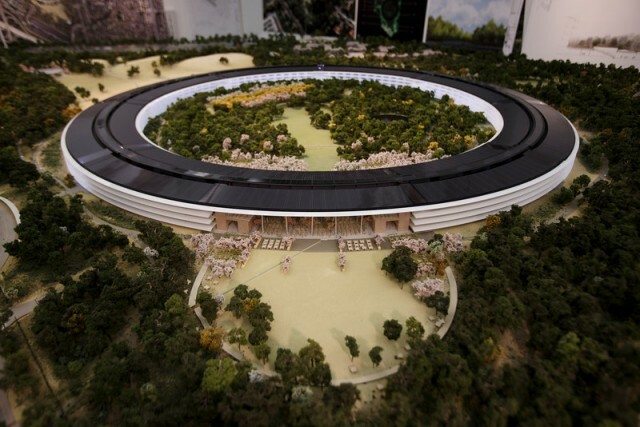 Apple’s corporate headquarters was originally located at Building 1 on 20525 Mariani Ave in Cupertino. The land east of Mariani One across De Anza Boulevard where the campus was built was formerly occupied by the company Four Phase Systems (later acquired by Motorola). It has an area of 850,000 square feet (79,000 m2). Construction began in 1992 and was compeleted in 1993 by the Sobrato Development Company. Before 1997, activities held on the campus were exclusively research and development. Until that time the buildings were referred to as R&D 1-6. With return of Steve Jobs to Apple in 1997, changes were made to the campus: Apple increased the number of occupied buildings, and many activities not related to R&D were moved to the buildings on Infinite Loop, at which point they began to be referenced by their IL # designations. Steve Jobs left additional marks on the campus, for example, banning employees’ pets and dramatically improving the cafeteria menu. On the night of August 12, 2008, a fire broke out on the second floor of the building Valley Green 6. The firefighters worked for hours until the following morning to extinguish the fire. No injuries were reported, but the forty-year-old building suffered USD $2 million of fire damage. 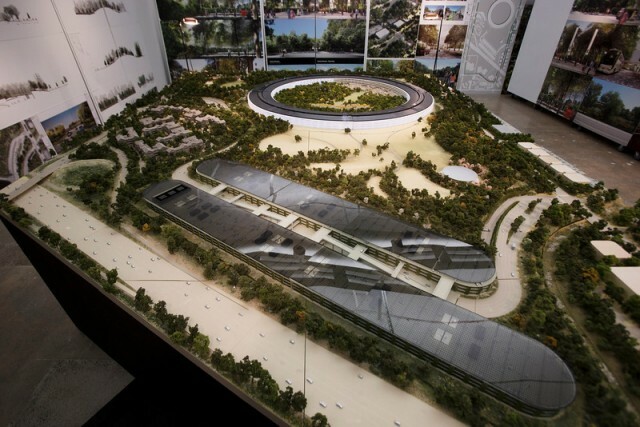 The Apple Campus is located on the southeast corner of Interstate 280 and De Anza Boulevard, and occupies 32 acres (130,000 m2) in six buildings spread over four floors. Each building is numbered with one digit on the private U-shaped street Infinite Loop, so named because of the programming concept of an infinite loop. The street, in conjunction with Mariani Avenue, actually does form a circuit (or cycle) that can circulate indefinitely. The main building has the address 1 Infinite Loop, Cupertino, California. Employees refer to these buildings as IL1 to IL6 for Infinite Loop 1-6. 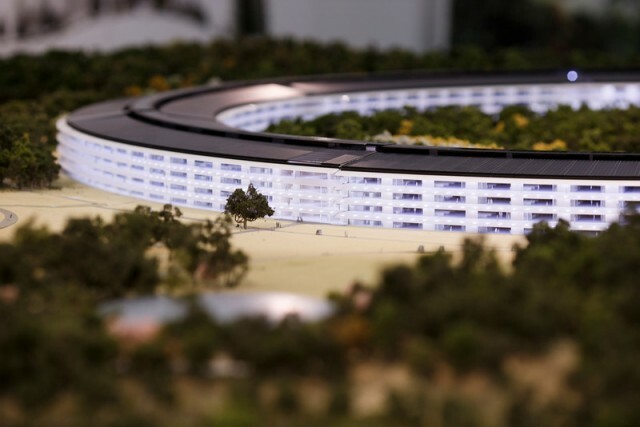 Besides the buildings on Infinite Loop, the whole Apple Campus occupies an additional thirty buildings scattered throughout the city to accommodate its employees. Some of these buildings are leased (with an average rental cost of USD $2.5 per square foot), while others are of recent acquisition; the land the new buildings occupy will be used for future construction of a second campus in the city with the aim of centralizing the activities of the company. In total, including nine newly acquired buildings on Pruneridge Avenue, the company controls more than 3,300,000 square feet (310,000 m2) for its activities in the city of Cupertino. This represents almost 40% of the 8,800,000 square feet (820,000 m2) of office space and facilities for research and development available in the city. 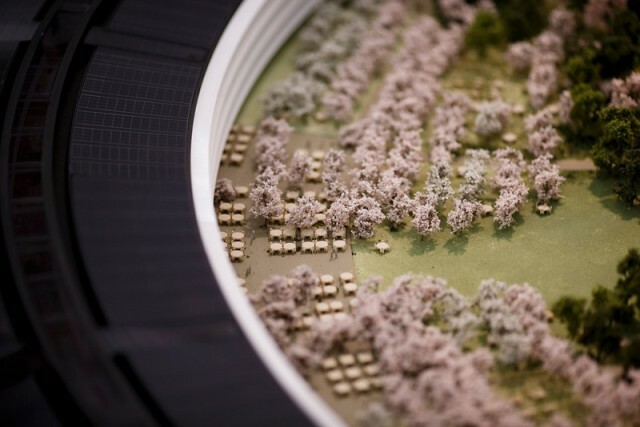 In April 2006, Steve Jobs announced to the city council of Cupertino that Apple had acquired nine contiguous properties to build a second campus, the Apple Campus 2. It will be located one mile east of the existing facility. Originally expected to break ground in 2013 and open in 2015, the project has experienced delays and is now expected to start in 2014 and open in mid-2016. The proposed second campus is also next to a Superfund site with a groundwater plume. Apple has had a presence in Cupertino since 1977, which is why the company decided to build in the area rather than move to a cheaper, distant location. Purchases of the needed properties were made through the company Hines Interests, which hid the name of Apple as a buyer to keep costs from skyrocketing. Among the sellers of the properties were Summerhill Homes (a plot of 8 acres (32,000 m2)) and Hewlett-Packard (three abandoned buildings of their campus in Cupertino, among others). The land cost was estimated at USD $160 million. The new campus design will take 3 to 4 years, and the project cost is estimated at USD $500 million. However in 2013 the total cost was estimated to be nearer to $5 billion. 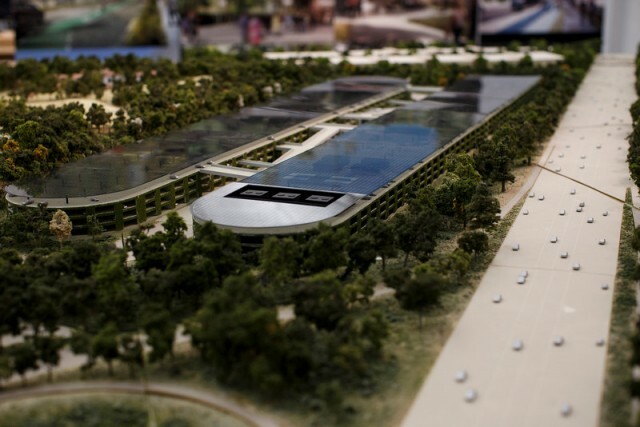 Until April 2008, Apple had not sought the necessary permits to begin construction, so it was estimated that the project would not be ready in 2010 as originally proposed; however, the buildings on the site are being currently held by Apple for its operations. In November 2010 it was revealed by MercuryNews that Apple had bought an additional 98 acres (400,000 m2) no longer used by HP, just north across Pruneridge Ave. This space used to be the HP campus in Cupertino before it was relocated to Palo Alto. The estimated amount paid for the land is USD $300 million. 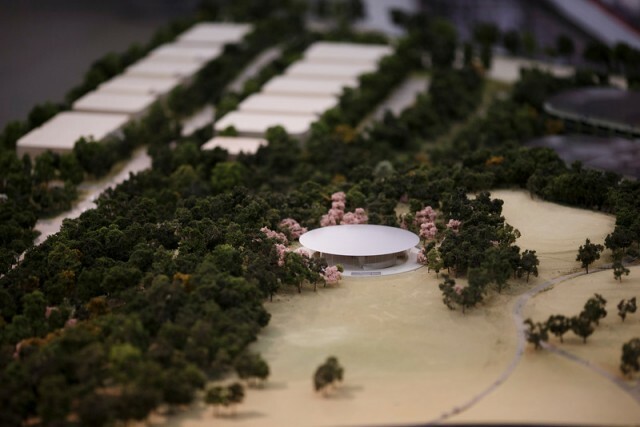 Additionally, El Economista revealed that worldwide acclaimed architect Lord Norman Foster is in charge of the design of the new campus. 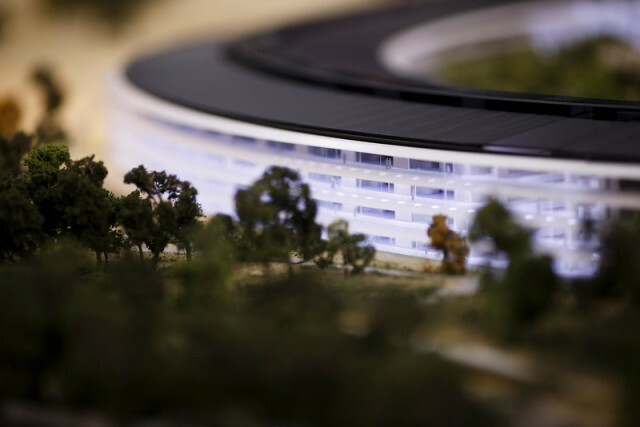 On June 7, 2011, Apple’s then-CEO Steve Jobs presented to Cupertino City Council details of the architectural design of the new buildings and their environs. The new campus, on a site now totalling 175 acres (0.71 km2), is planned to house up to 13,000 employees in one central four-storied circular building of approximately 2,800,000 square feet (260,000 m2), which will include a café for 3,000 sitting people, be surrounded by extensive landscaping, and offer parking both underground and in a parking structure. Media reports widely described the new structure as “spaceship”. Other facilities include a 1,000 seat auditorium, 300,000 square feet (28,000 m2) of R&D facilities, a fitness center, an orchard, and a dedicated generating plant as primary source of electricity (powered by natural gas and other more environmentally sound means). 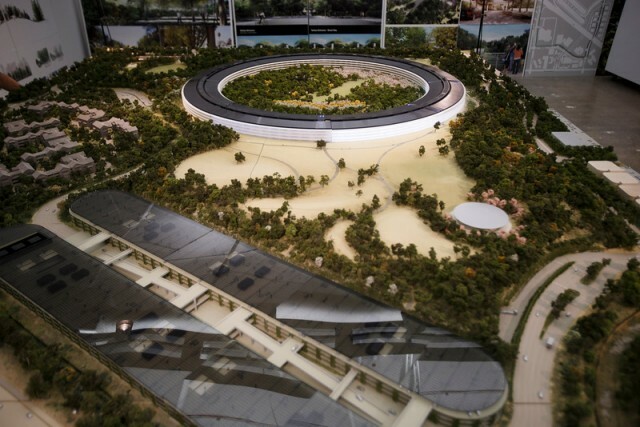 Jobs: “It’s got a gorgeous courtyard in the middle, and a lot more. It’s a circle, so it’s curved all the way round. This is not the cheapest way to build something.” Every pane of glass in the main building will be curved. The existing ratio of built-up area to landscaping on the site is 80:20. 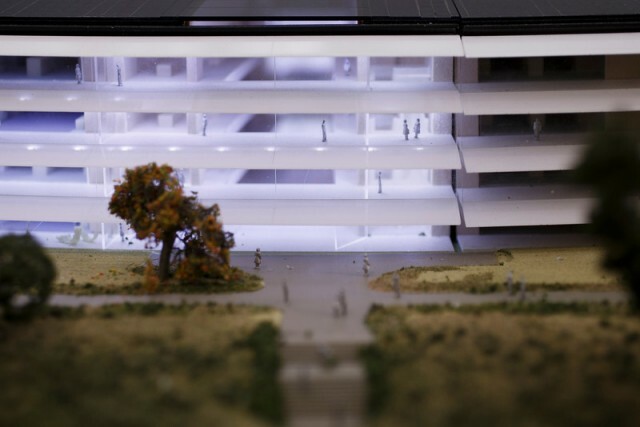 After Apple’s redevelopment, this ratio will be reversed so that 80% of the redeveloped site will be greenery. 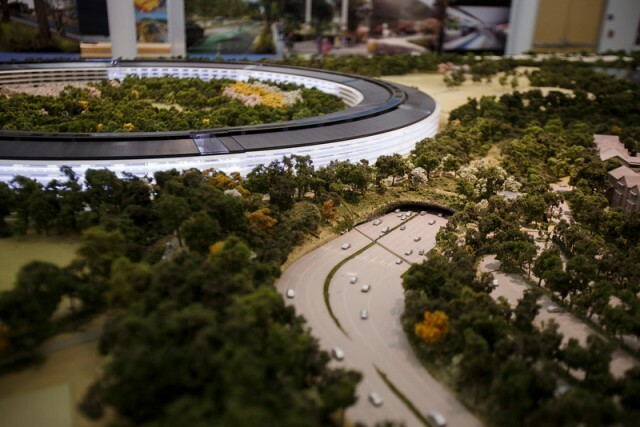 On October 15, 2013, Cupertino City Council unanimously approved Apple’s plans for the new campus after a six-hour debate. – © wikipedia.com.